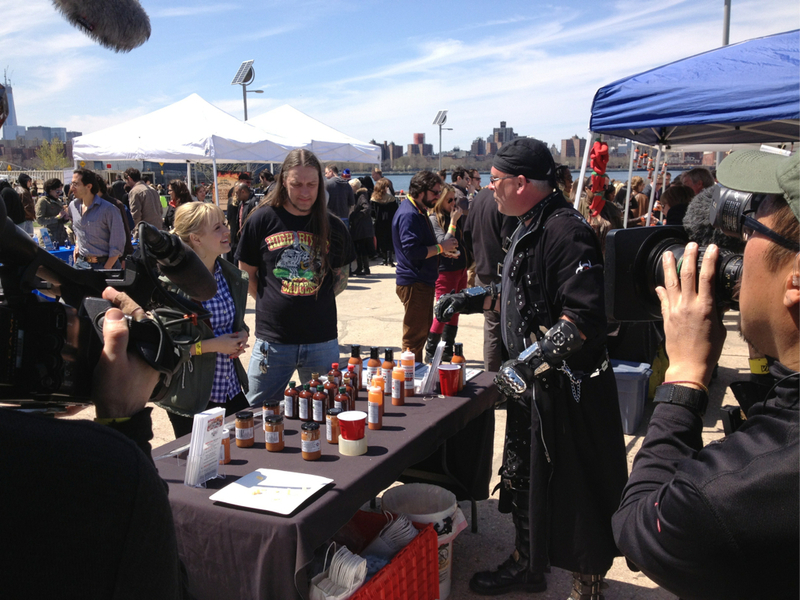 Food Network Star Kelsey Nixon and host of Kelsey’s Essentials asked High River Sauces owner Steve Seabury to take her on a spicy adventure at the first annual NYC Hot Sauce Expo, one of the most buzz worthy food festivals in the country. Seabury charters an in-depth journey around the Hot Sauce Expo and provides insightful information to Kelsey about the different unique hot sauces styles, various peppers types used and how these sauces are used to enhance your savory and sweet food recipes. The NYC Hot Sauce Expo highlights the best and most talented artisanal hot sauce companies from around the country and hosts the prestigious Screaming Mi Mi Awards. During the segment Kelsey stops by to discuss with a handful of vendors including Peppers Distribution, Puckerbutt Pepper Company, Defcon, Heartbreaking Dawns and others about the history of hot sauces, the characteristics and medicinal measures of the chile pepper and how the popularity within the mainstream has tremendously increased sales in North America the past couple of years. After the Expo, Kelsey visits JoJo Collins who truly turns up the heat on her homemade Sriracha! Kelsey then gets started on her own hot sauce menu: Fresno Pepper Hot Sauce, Spicy Kale Caesar Salad and Spicy Roasted Chicken with a Hot Sauce Compound Butter. 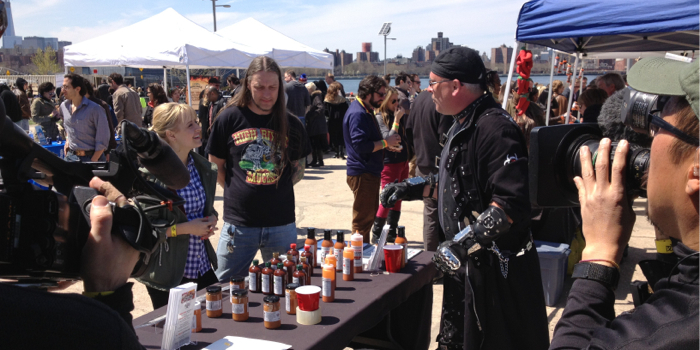 Our own collection of pics from the 1st Annual NYC Hot Sauce Expo are here. 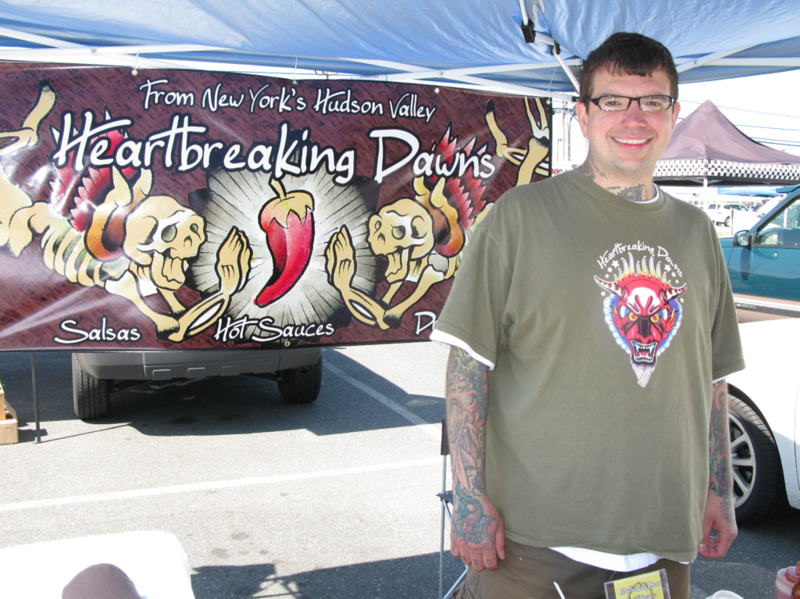 One of the most creative individuals in the hot sauce business today is Johnny McLaughlin of Heartbreaking Dawns Artisan Foods. This is a reminder that Johnny will be appearing on Food Network’s Chopped this Tuesday, January 3rd, at 10PM Eastern / 9PM Central time. Set your DVR’s and Tivos now folks! Johnny McLaughlin is a well known and highly respected chef and hot sauce creator that began his Heartbreaking Dawns company just under 2 years ago. Johnny and his wife, Nicole started out with only 3 hot sauces, and have since grown their product line to over 50 items.